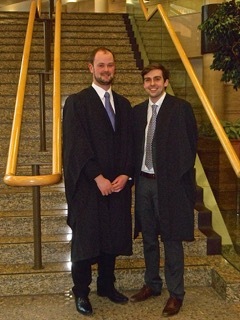 The University of Strathclyde Mooting Society held the semi-finals of its mooting competition in the High Court of Justiciary in Glasgow, with the two fixtures judged by Sheriff Miller and Sheriff Mackie. The two winning teams of Angus Brown and Andrew Park, and Paul Cannon and Andrew MacQueen will now compete in the final. The question will be a family law/human rights one written by Professor Kenneth Norrie of the University’s law school. Next month will see the Mooting Society hold its final in the UK Supreme Court for the first time, with Lord Reed judging, after having entered a competition to be allowed to hold it there at the beginning of this year. All 16 quarter-finalists from the mooting competition will be travelling to London to watch the moot final take place.